This clubby, feel-good song is the 3rd single from Confessions On A Dance Floor, released commercially June 6 in the US and a few days later in several European markets. The UK release date was July 24, 2006 to coincide with the British leg of the Confessions Tour. 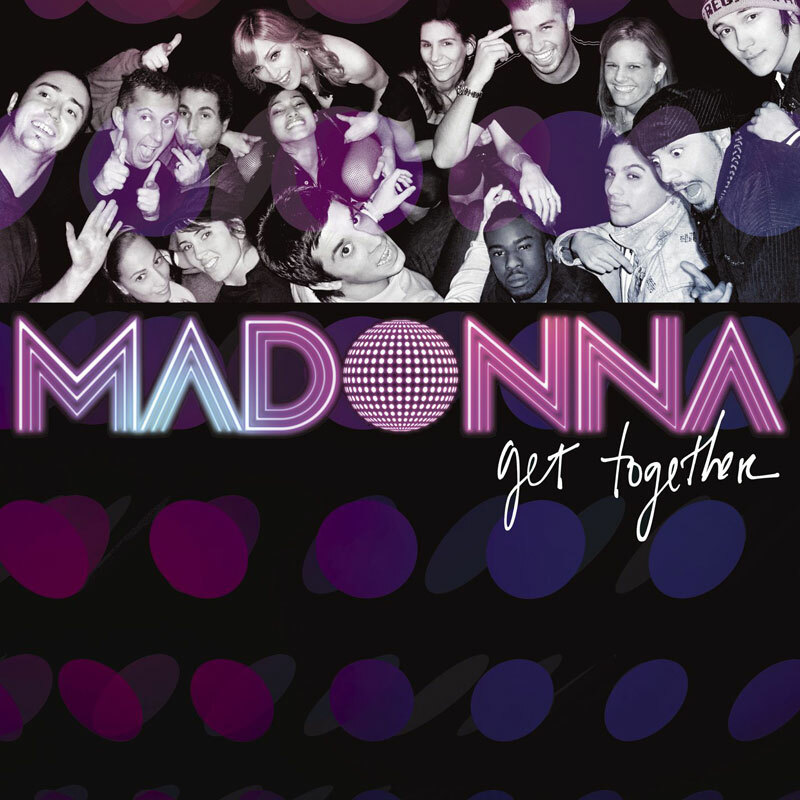 The single cover features Madonna together with her band and dancers. Thanks to the remixes by Jacques Lu Cont, Danny Howells, Tiefschwarz and James Holden, Get Together became Madonna's 36th #1 hit on the Hot Dance chart, confirming her status as the 'Dancing Queen'. It failed to chart on the Billboard Hot 100, but entered the Bubbling Under chart, peaking at #6. The single managed to crack the top 10 in Spain (#1), Hungary (#1), Canada (#4), Italy (#2), Finland (#6), UK (#7) and Slovakia (#9). Get Together was nominated for 'Best Dance Recording' at the 2007 Grammy Awards. With Madonna performing on her Confessions Tour, there was no time to make a studio video for Get Together. Instead of opting for a live performance video, commercial and video director team Logan had an animation video made, using footage from her performance at London's Koko Club (November 2005) which was digitally altered and animated onto a digital futuristic city/nature background, which is reminiscent to the video style of Daft Punk and is inspired by the work of Italian comic-book artist Milo Manara. The video premiered online and on music TV channels mid-June 2006. Almost a year later, in May 2007, ICON members received an alternate version of the animated video, directed by Eugene Rockstar. This ICON version features on the Celebration Video Collection. After opening her Confessions Tour with Future Lovers, Madonna performs Get Together on the main stage, dancing with two male dancers. The backdrop is in all tones of red with pictures by Steven Klein. She teases the fans on front row (including yours truly) by lying down on the catwalk and seducingly rolling around. To see her that close, it's certainly *not* an illusion!